Pub is The Hub, the rural pubs champion, launches its local services initiative in the Borders on Wednesday (January 20) at The Lodge, Carfraemill, near Lauder. The not-for-profit organisation, in partnership with Scottish Borders Council, is supported by the Scottish Government, the Prince’s Countryside Fund and drinks company Diageo. Pub owners and operators, suppliers and local authority representatives in the Borders are invited to attend the launch event. Pub is The Hub has supported hundreds of pub licensees and communities across the country in diversifying their businesses since its inception in 2001 by Prince Charles. Representatives from the Pub is The Hub team will be at the event to showcase advice, support and funding opportunities for pub operators and owners who are considering a diversification scheme to improve and support rural services. Examples of such schemes include siting post offices, shops, libraries, internet cafes, allotment schemes, school dinners, cashpoint machines, IT training and community cinemas in pubs. Local pub owners and operators will be able to apply for grants of up to £4,000 towards setting up such schemes. Chief executive of Pub is The Hub, John Longden, said: “It has been a long-term goal for us to extend our special brand of local-services-in-pubs to Scotland. “We are thrilled that the Borders is ready to take the plunge with us. 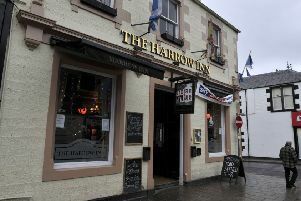 Stuart Bell, portfolio holder for Economic Development at Scottish Borders Council, said: “We are delighted to be involved in the Pub is The Hub launch in Scotland and welcome the opportunities for rural publicans to diversify their services. Pub is The Hub has engaged the support of Gordon Izatt, an experienced advisor in licensed hospitality, to act as the advisor for Scotland, and he will be the local point of contact and advice for licensees undertaking any schemes. In the meantime, anyone interested in attending the launch event on Wednesday can call the office on 01 423 546165 or email samhope@thepubisthehub.org.uk.